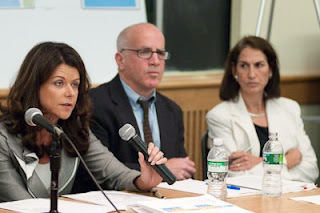 This letter has not been written by Forest City Ratner’s point person on Atlantic Yards, MaryAnne Gilmartin (at left, with Steve Matlin and Rachel Shatz of the Empire State Development Corporation, in photo by Adrian Kinloch). But I like to think it could have been. On behalf of Forest City Ratner (FCR) and our parent company, Forest City Enterprises (FCE), I want to apologize for the disgraceful conduct of some Atlantic Yards supporters at the state Senate oversight hearing on May 29 and the Atlantic Yards informational meeting last Wednesday, July 22. It was wrong to disrupt the hearing with whistles and heckling, and it was wrong to disrupt the meeting with chanting and heckling. I felt very uncomfortable at times during the meeting last week. Please note: these activities were not directed by FCR; the disruptions were the work of unions who expect work on the Atlantic Yards project; representatives of some of our Community Benefits Agreement (CBA) signatories (part of our “team,” as I said on Wednesday); and groups that may or may not have any connection to the project. Also note: just because my colleague Scott Cantone walked into the hall at about 1:10 of the video below and, less than a half a minute later, a bunch of men interrupted by chanting “Go home,” there is no indication of any direct connection. For the record, I must point out, project opponents are hardly angels. Some of them were quite rude on Wednesday night and they have periodically taken nasty potshots at us and, especially, CEO Bruce Ratner. (It’s unfortunate that his name so easily lends itself to derision.) During the August 2006 hearing on the Draft Environmental Impact Statement both sides heckled and were somewhat disruptive. However, the fault at the last two governmental meetings has been that of our supporters. None of our representatives were on the panel during the disruptions on May 29. However, I was sitting at the table last week. And I believe we at Forest City Ratner have a higher obligation. Sure, I want the Atlantic Yards project to move forward. But I want us to win fair and square. After all, if it is in fact “a relentless campaign of a few to deny benefits to the many,” as I said Wednesday night (thank you to the two p.r. firms we had in the room for wordsmithing), we should be able to win fairly. His sentiments are sincere, but he has, to say the least, an awkward way of expressing them. Similarly, it was inappropriate for the Rev. Herbert Daughtry, head of our CBA signatory DBNA (Downtown Brooklyn Neighborhood Alliance) to regularly heckle during the state Senate hearing. However much we would rather not have had the hearing, we recognize that Senator Bill Perkins was pursuing his right and duty as head of the Senate’s committee overseeing corporations and authorities. A Senate hearing is like a court hearing; no one should ever heckle. Rev. Daughtry, another member of our “team,” is sincere, but he too has an awkward way of expressing his enthusiasm for Atlantic Yards. I take seriously the Core Values that guide how Forest City’s business is conducted. In all our dealings with all stakeholders, we will uphold the highest possible standards of ethical behavior. Our interactions will be characterized by an attitude of openness, candor and honesty. We are committed to the general welfare of the communities in which we live and work. We will develop and maintain excellent relationships throughout our communities and always work to balance our business interests with the needs of our communities. To uphold the highest standards of ethical behavior, and to balance our business interests with the needs of our communities requires a higher standard than was displayed on Wednesday. People chanted “Go Home” and “Jobs,” while the moderator of the event asked fruitlessly for order and could not--or would not--call in security guards or law enforcement. Those disrupting the meeting did not listen to the Community Board representatives. They probably would not have listened to the representatives of the Empire State Development Corporation (who, on May 29, also remained silent). 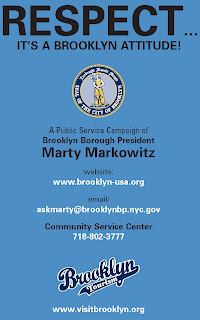 They might have listened to Brooklyn Borough President Marty Markowitz, who believes in "Respect." But they probably would have listened to me. I should have done more. I also want to put to rest the personalization of the conflict that has unfortunately persisted. Some on our side have specifically targeted Daniel Goldstein, the most prominent of the opponents, the spokesman for Develop Don’t Destroy Brooklyn and the lead plaintiff in the eminent domain suits. Goldstein may seem to be a media hound, and thus an easy target, but the Atlantic Yards debate cannot be reduced to a conflict with him. It’s about what we do collectively. I too appreciate musician John Pinamonti's "The Burrow"; yes, his song opposes Atlantic Yards, but we can embrace some of the same sentiments and be stronger for it. Do keep in mind that the ESDC has pledged to cut off the microphone after three minutes and to remove people who are disruptive. That makes sense. The behavior exhibited last Wednesday and on May 29 would never fly in Westchester, where I live. It shouldn’t be tolerated in Brooklyn, either. It diminishes Forest City Ratner and all of us who believe in community.